Peaceful assembly happens every day in the United States, whether it’s you and your friends meeting for lunch. Maybe you’re gathering for Sunday services at your church. In Baton Rouge, it could be an LSU football game at Tiger Stadium. What you don’t see at those peaceful assemblies are police in armored suits that look ridiculous to even veterans of modern combat. The cops turned out to face black members of the community as if they were stopping a slave revolt. What’s the difference? Your friends at lunch or your congregation at church aren’t considered a “threat”.Neither are the fans who gather on LSU’s campus for football games. 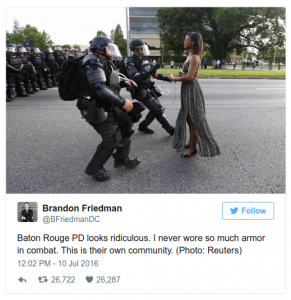 What made protests over the weekend in Baton Rouge a “threat”? The Baton Rouge Police Department did. Did the protesters intend to be violent from the start? Would they have thrown objects at the cops had BRPD taken a less-aggressive stance? Did the cops need to turn against members of their own community? The catch is that BRPD doesn’t consider black folks part of the community. They saw this reaction to them committing homicide as a slave revolt. The Washington Post runs down, and yet again, how the feds offer military surplus weapons and equipment at deeply-discounted prices to local police. BRPD clearly has taken advantage of these programs to produce their own little badly-trained militia. Ridiculous. It’s clear that what happened in the Alton Sterling homicide was shoddy police work. Furthermore, their behavior is arguably criminal. From the beginning of the confrontation, all the way through terrible handling of witnesses and evidence after the cops killed Sterling. BRPD’s response to their own poor performance is to take the attitude that the blacks need to be put in their place.